The guidance follows similar guidance agencies received from the Obama administration in preparation for the fiscal 2017 budget—the last year before the process involved special procedures related to the presidential transition—when they were advised to cut their spending proposals by 5 percent, with separate submissions for increases that would not boost their overall spending relative to the previous year. Like then-OMB Director Shaun Donovan, Mulvaney directed agencies to rank their proposed funding escalations in priority order. The fiscal 2019 budget process will also provide the mechanism for agencies to finalize their reorganization plans as required by an executive order signed by President Trump in March. 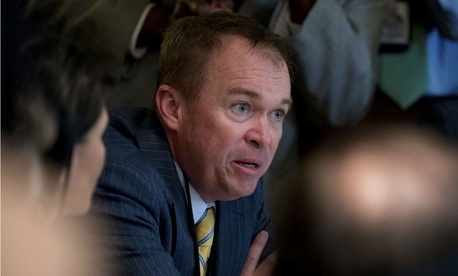 Mulvaney vowed to give “special consideration” to the boldest among the reform and restructuring proposals “that have the potential to dramatically improve effectiveness and efficiency of government.” The budget should spell out the savings estimated from those reforms, as well as any initial upfront costs involved in implementing them. If those costs exceed the 5 percent threshold, agencies must provide a “robust justification” for the long-term benefit. Mulvaney instructed agencies to divide their reform ideas into four categories: eliminating activities, restructuring or mergers, improvements to organizational efficiency, and workforce management. Trump’s EO and ensuing guidance from OMB directed agencies to develop long-term plans to trim their workforces. Preliminary, high-level proposals were due to OMB by June 30. Agencies will not include proposals that shift costs to other parts of the budget in their spending estimates, and should consult with OMB to determine the best way to present suggested major organizational changes. OMB also directed agencies to prioritize goals of the Trump administration. The White House office recently announced it had instructed agencies to no longer report on the goals established by the Obama administration. The objectives for the fiscal 2018-2019 cycle should be “near-term, implementation and outcome focused, measurable and reflect the performance priorities of agency leadership,” Mulvaney said. Continuing one priority of the Obama era, Mulvaney also asked agencies to submit proposals that would boost their use of evidence and data to improve government effectiveness.